Flesh-eating disease in Pangasinan, start spreading? Home » Flesh-eating disease » Health » News » Pangasinan » Flesh-eating disease in Pangasinan, start spreading? A mysterious disease starts spreading in Pangasinan province and now making round over the internet. The illness was called 'Flesh-eating disease,' where skin will begin to have wounds all the way to the flesh and bones, the worst will spread all over your body and face. 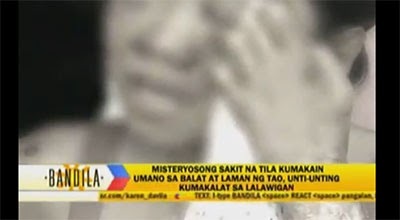 According to ABS-CBN News, the girl who has this kind of illness have tried to consults all medicine experts in Pangasinan and even in Manila but there's no good results about her disease. And also with the boy who have this kind of illness in Pangasinan didn't know what to do because even doctors that they consulted did not know the cause of this disease. The flesh-eating disease in Pangasinan was predicted by Sadhu Sundar Selvaraj. He said that the grievous disease will spread all over the world and will consume the flesh of men and will pierce through the bones, and it will begin from Pangasinan. We don't know yet if this is real. But don't be so worry because if you have God in your heart, everything will be okay. For the meantime, please bookmark it now or visit this site more often for you to be updated. You may also share this post to your friends so they may know about Flesh-eating disease in Pangasinan. Comments or suggestions about "Flesh-eating disease in Pangasinan, start spreading?" is important to us, you may share it by using the comment box below.